Released in 1946, the film was not well received at first. It tells the story of George Bailey, the small town hero who sacrifices his youthful ambitions to save the family building and loan for the sake of the town. Now a cult classic, most folks have seen part or all of the film at some time or another through years of Christmas television re-runs. Film critics routinely lambast Capra as being an idealistic filmmaker who oversimplified his plots. George was a good guy who met a nice girl, and had nice children. Despite almost being ruined by a miser on Christmas Eve, everything works out in the end because his guardian angel showed him the real meaning of life. That’s too simple; stupid even, they say. As I’ve traveled back to George’s fictional life the last several years at Christmas, it’s made more sense to me each time. George’s life was a series of choices made. Most of them were right, but they progressed along the time line largely beyond his control. The film is not without a sense of fate. George wanted things that he couldn’t have, but he got what he needed and ended up wanting that instead. As a result of those choices, most of which were made for him, he ended up a very content man at the end of the movie. In the middle he was miserable, but once he was given perspective on the situation, he realized that the things that were making him miserable didn’t matter anyway. George lived in a small town where everybody knew his business. He was one of the most popular and well respected men in town, and yet in a crisis, he stood on the bridge looking at the icy water below. He was there because he still wanted things he didn’t need. He wanted money and influence and control over his life. What he needed was to realize that he’d gotten where he was not by his own design, but by a higher power’s. All he had to do was go on being George Bailey. When he wakes up on the bridge after having met the angel and seeing how miserable his town would be without him, George is ecstatic to be alive. His car is wrecked, his lip is bleeding, and he’s probably going to jail for something he didn’t do. None of that matters though, because George has seen the alternative. Of course in the end, he doesn’t have to go to jail. His friends help him out. I suppose that’s what the experts think is idealistic. To me it seems the most real. When George was doing okay he didn’t think he had any friends. Nobody was worried about George because they had no need to be. Suddenly when his car’s wrecked, it’s Christmas Eve, and he’s in trouble with the law, he has plenty of friends. Sounds like real life to me. Humans are mostly concerned about themselves on any given Tuesday when there’s not much shakin’. On Christmas Eve when the chips are down for a guy who really doesn’t deserve it, you can bet the folks will show up to help. Rather than call it idealistic, I’d call it optimistic. The film allows us to see the best in the hero, and the best in the town. The villain ends up alone and out of the final shot on Christmas Eve. That’s how villains end up in real life. Figuratively or literally, they end up alone by their own machinations. The good guy ends up in a room full of friends by accident. 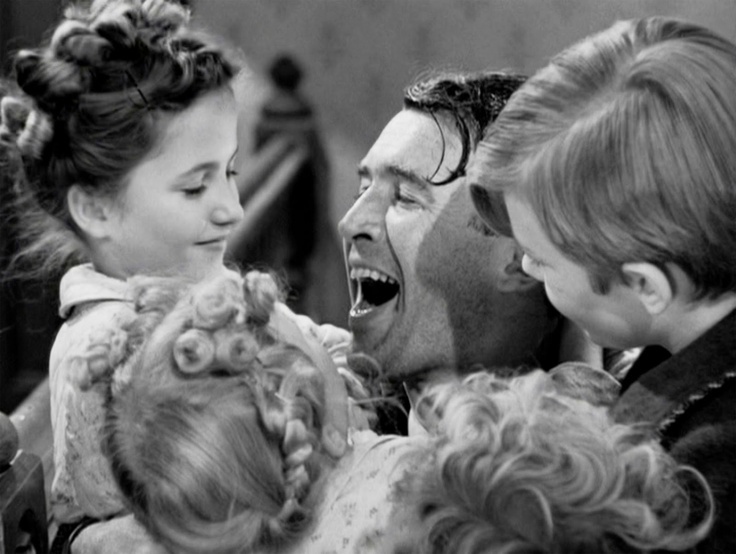 During this especially hectic time of year, be sure to take advantage of time machines like “It’s A Wonderful Life.” And leave a place in your heart for a little optimism. Even a scrooge like me who’s known throughout the year for being a realist can be optimistic in December. Sometimes optimism is real too. *I wrote this a couple years ago. Thought I’d share it again for the season. Merry Christmas! One minute you’re here, the next you’re not. Such is life. As entertainment has gotten more and more violent over the last thirty years, it has become more common for writers and directors to build a character up only to rip them from the story in a moment with a sniper shot. The person who just saved the day is usually walking and laughing along when, from out of the blue, their head explodes. They never see it coming, and it’s most unsettling to watch. When you think of all the vets that have had to witness it in battle, it’s no wonder they have trouble rebuilding their lives when they get home. All’s fair in love and war, but to execute someone without any chance of defense is both callous and cold-blooded. It’s regrettable that treachery has become so commonplace in our culture, but here we are. I watched a show where one of the characters got sniped the other day. I won’t tell you which one because I’m ashamed I was watching it. It’s one of those train wrecks I just can’t seem to look away from, but it’s not at all uplifting. Then last week I became aware of another kind of sniper, one with a much less permanent and consequential result. I got nailed by a Facebook sniper. It would seem I made a mistake. I’m sure the reader is shocked to learn that I’m capable of doing so, but it happened. It was a fairly insignificant thing that I could’ve completely corrected in less than five minutes, but the sniper was not so kind as to allow me that courtesy. Instead of picking up the phone and alerting me to my error, they picked up the i-Phone and went to social media to tell the world what a buffoon I am. Classy. It wasn’t till one of my actual (non Facebook) friends called later in the day that I found out I was being lambasted by a bunch of people I didn’t even know. Sticks and stones may break my bones, but small people on the web will never hurt me. It was a trivial thing, but it did take the wind out of my sails for a couple hours. That’s my fault for sweating the small stuff. Like alcohol, some people can use social media responsibly. Others just turn into drunken idiots who hurt everyone around them. There’s an old Johnny Paycheck song that says: “But you know every beer joint that you’ve ever been in. Some big, mean drunk who just ain’t got no friend. Sure enough, he wants to fight. Yeah, he’s gonna whip everything in sight.” That’s Facebook for you; a bunch of big mean drunks with no friends. Most people just go in for a drink, but there’s one in every crowd who can’t wait to pick a fight. Less than a week after that sniper took a potshot at me, I was sorry to see a colleague get hit. What purpose did it serve? None. It was just someone who should’ve known better taking advantage of a situation. I suspect a little green eyed monster had more to do with it than anything else. Author, Wendy Mass, wrote, “Be kind, for everyone you meet is fighting a battle you know nothing about.” The reader might note that anyone writing internet attacks at one o’clock in the morning might have more issues in their life than their words imply. The internet is a wonderful tool that has brought much knowledge and efficiency into our lives, but the power that it brings is a dangerous one. Voltaire told us that great power imposes great responsibility. This was never truer than with the bullhorn that is social media. Inciting a riot is a crime, but there is no sheriff on patrol in cyberspace at 1:00 am. The damage those rioters do is generally emotional, not property. It’s harder to prosecute even if there was a sheriff. The moral of the story is this: Think before you post. I imagine someone is scoffing at this point. With all the things I’ve published here, you might think I should heed my own advice. My material gets reviewed and re-reviewed by me before publishing, and it has to get past my editor after that. I can only imagine how much trouble I’d be in if I just wrote it up in the middle of the night and put it out there without anyone reading. If only I could get someone to edit all my emails and text messages, I’d probably have stepped on far fewer toes over the years. Even with those, I’m learning to slow down and think before pushing send. With each gray hair I’m thinking more about how people will take things, and what I’m actually trying to say. After all, there’s no body language or inflection in an email or web post. We may rarely mean to take potshots, but a keyboard is like a gun. It must be handled with respect for human life. Race riots, constitutional crisis, and a Cosby scandal; news junkies certainly have had plenty to read the last couple of weeks. Each story seems to be more outrageous than the one before, and it’s likely that this is just the tip of the iceberg. The moves and counter-moves in culture and politics have been very violent of late. Historically when this happens things must get a lot worse before they get better. It’s always darkest before the dawn, and we’re just witnessing the evening hours of this humankind super cycle. The dark ages started in much the same way. Humanity is always at its peak of knowledge before it plunges back into the dark. Audacity is a word that got thrown around quite a bit a few years ago thanks to somebody’s book. Plenty of people have been taking audacious action lately, but brazen is the word that might describe it better. Impudence and brazenness are what we see more than anything else these days in politics and pop culture. It doesn’t matter which side you take, respect is in short supply everywhere. A certain Secretary of State was quoted a while back speaking about foreign policy and military intervention. “We came, we saw, he died,” she said of a foreign dictator. That has to be one of the most brazenly unthinking remarks I’ve heard from a national leader ever. Julius Caesar doesn’t represent the type of leader I want for my Republic. His appearance in history marked the end of the Roman Republic and the birth of the Empire. It’s ironic to see a liberal icon like Hillary Clinton quoting Caesar and espousing American Imperialism. For years I’ve listened to her people talk about the invalidity of foreign wars. Now that the war machine is in their control, there are all sorts of hotspots where they’d like to go, and see, and conquer. Veni, vidi, vici. “You’re either with us, or you’re with the terrorists,” is another quote that makes a person feel uneasy. When that one was uttered many years ago, it was at a time when people were scared and needed reassurance. It only took about a decade to get from that type of absolute statement to veni, vidi, vici. It makes you wonder what is coming in the next decade. You couldn’t pick two politicians that have opposed each other more than W. and Hillary, but it certainly seems that they’re teammates more than enemies. They’re from the same generation after all. It’s a bit cliché to blame the generation ahead of you for making a mess of the world, but it’s easy to see why people have always done it. Somebody made the mess. Mankind has always had a way of blaming somebody else for their problems. It usually takes a lifetime to seize the reins of power, so the long toothed are the easiest ones to blame for whatever is going wrong in the world. Right now, the people in power were part of the 1960’s counter-culture. This makes them particularly suspect. For the first time in American history we have unabashed dope fiends and free lovers in charge, and we are reaping the whirlwind. Who knows where their experimentation will end, but it should be an exciting ride. These audacious radicals that currently steer policy didn’t seize power in a vacuum. The people who know better have allowed it to happen due to our apathy and indifference. We got comfortable in our lives, turned on the TV, wasted time on the internet and tuned out on the things that matter. That’s how it’s always been. If mankind isn’t singularly focused on survival we get into all sorts of trouble. I’ve been thinking a lot about Dickens this week. It certainly is the best of times and the worst of times. Even some of the poorest among us in this country enjoy the highest standard of living that humankind has ever known. Every convenience is at our fingertips. Survival is almost assured for those who want to stick around. With all that going for us, we’re surrounded by depravity, war, and a culture that is obsessed with death. It is the best time to be alive in history, and yet most of the time we’re planning a funeral for the human race.